I’ve been wanting to write this post for four-plus months now. But it’s taken me that long to get my thoughts together. Some of that is because I’m sleep deprived and suffering from serious mommy brain. But most of it is because I really wanted to get to the root of why my workouts — and how I feel about them — have changed so much. Turns out, those roots are deep, yo. After writing this post a little more than a month after having Gwen, I began to gently (and with a lot of self love) ease back into my usual routine of healthy eating and working out. Once Gwen was about four months old with more of a predictable napping and nursing timeline and my body was truly ready for more intense workouts, I started hitting the gym more regularly and with a renewed focus. Now that Gwen is six-and-a-half-months old, what started as a rocky post-baby body image has exploded into something I deeply and truly love — and I could not care less about what I look like or the number on the scale. 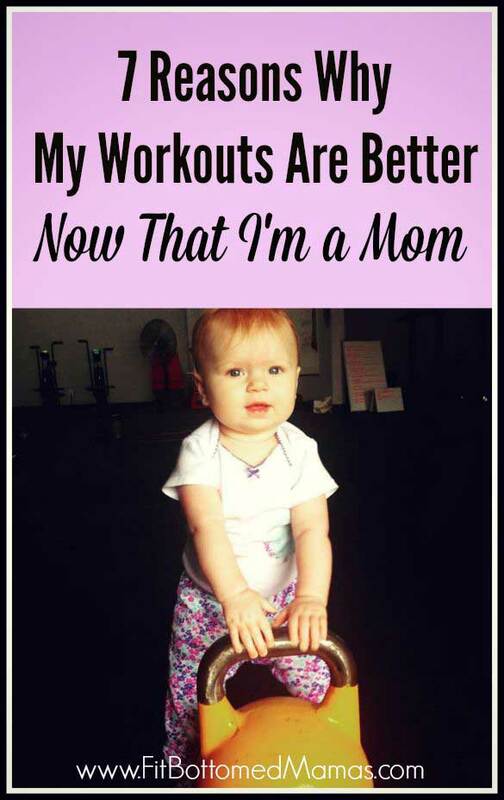 When it comes to my workouts, my mindset has completely changed since having a baby. And it’s changed for the better. 2. Control. Giving up all control is a natural byproduct of having a baby. And it can make you a more enlightened person by helping you to live in the moment, let go of that massive to-do list and being easier on yourself (like, um, you CANNOT be the perfect mom, wife, employee, etc. at all times. You might excel at one of those things for a few hours or maybe even a whole day, but it’s a balance of all the priorities at all times). But doing a workout? Well, that you can control. As long as the baby is napping or being looked after (which, OMG, I have the best gym ever because there’s always someone there to help me out with Gwen when I bring her — Sheryl, Tina, Nicole, Erika … I’m talking to you! ), you can give a workout your absolute best, your hyper focus and everything you got. And, for me, that feels AWESOME. 4. Progress is fun! The first few weeks back at the gym after baby felt darn hard. But, my fitness and muscle memory came back pretty quickly and seeing that progress and improvement in my abilities was kind of intoxicating. 5. I’m an example. On the days that Gwen is at the gym with me, there is nothing better than looking over at her and seeing her watch me push myself. I don’t just want to tell her that she can do whatever she puts her mind to; I want to show her. The gym is one of the places I can do that. 6. It helps me manage my energy. Before having a baby, I might have stayed up late and still made it to the gym for that 5:30 a.m. class. Or, I might have had an extra glass of wine at night. But now I know how precious my energy is and I’m acutely aware with how it’s affected by things both inside and outside of my control. A few workouts a week actually give me energy, but having a baby has made me more intuitive and aware about making sure I take steps to save that energy for the important things (read: going to bed earlier with baby so that I have the energy to do that workout or even opting for a short walk or run because it leaves me with more time to play/nurse baby through a growth spurt/make sure she gets a good nap, etc.). 7. Compared to childbirth, workouts are cake. Seriously. Any time I’m in the middle of a hard workout and I start complaining to myself or wanting to stop, I think about this. Perspective is everything. Really, our bodies are AMAZING. And being a mother is an incredibly challenging experience at any and all stages. But in it, I think it’s important that we don’t become solely that role. 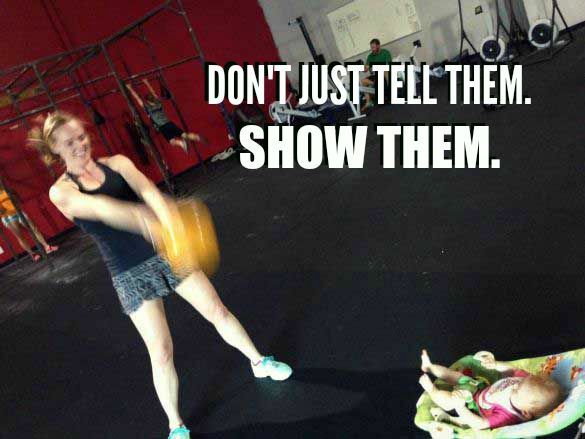 That we realize that we are more than “mom.” But at the same time find the joy and gratitude in the privilege that it is to be a parent and the ability to both grow a human and swing a kettlebell (or Zumba or run or walk or whatever workout you dig). Workouts, for me, have been a medium to experience both that awe and that independence. They’ve provided a much deeper and more fulfilling motivation to be my best — rather than just getting my “pre-baby body back.” Turns out, my post-baby body is THE BEST THING EVER. OMG, that picture of Gwen with the kettlebell is adorable! Your post captured a lot of my feelings about working out after having kids. It’s not about trying to get back to a certain clothing size and more about providing that example for my kids as well as making sure I can keep up with them! And the “me time” thing isn’t just for moms. My husband is a SAHD and uses his workout as an outlet during the day to focus on himself (even if the kids are playing nearby). YES! I also find that Gwen loves to get out of the house. The gym gives her that time to be in a new place and watch, what I call, “adult day care.” Haha.